It happens every year! After the wrapping paper is recycled and the thank-you notes are written, I find myself reflecting back on the whole gift-giving experience with friends and family. It is a tradition I approach annually with both anticipation and trepidation. Do people need more stuff? Have I been thoughtful in my choices or simply pressured into an activity ingrained in my seasonal rhythms over the years? How did this tradition come to us? Some faithfully attribute gift-giving to the reverence of the Three Kings who brought gifts to a baby Jesus. Others connect the tradition to the earlier Roman celebration of Saturnalia held in December to honor abundance and the return of light. Still others see the blossoming of gift-giving as a way to shift the attention of the holiday to children, especially with the appearance of the gift-giving Santa Claus in the early 1800s. Regardless, gift-giving has found its way into many fall/winter holiday traditions, including Eid al-Fitr, Chanukah and Kwanzaa. Certainly, when I was a child, it was the pile of gifts that marked Christmas for us. And, with five children, my parents had their work cut out for them. Our Christmas mornings were a cacophony of ripping paper, mechanical toys chased by barking dogs, music on the stereo, and squeals of excitement and gratitude yelled across the room. But at some point I transitioned from gift-receiver to gift-giver. We all do, continuing a cycle of values modeled by those who first gave to us; whether for Christmas, a birthday or some other celebration that involves the giving of gifts. As we grow into our own gift-giving philosophy, we may change some of those values (i.e. handmade vs store bought; time together vs an object; one big gift vs lots of little gifts), but the tradition of giving remains. And each year I try to be wiser, or at least more thoughtful about the act of giving. What is it that we accomplish by the act of giving gifts? Lewis Hyde, in his seminal work The Gift (a foundational reading for the MACS program) explores the concept of the gift economy as a critical element in nurturing the values and traditions that sustain communities. He despairs that our culture is defined by money and an economy shaped by the power to buy and sell commodities. While he is especially interested in the artist’s gift of creative talent with its boundless and reverberant nature, his ideas resonate with any form of gift-giving or receiving. He suggests that “we suffer gratitude” when a gift is received and that suffering “enlivens us.” Gratitude compels a sense of reciprocity. We might give a gift in return, offer a kindness, or draw the giver more deeply into our confidences. Such reciprocity weaves the strands of our community more closely together, thus extending the power of the gift, the kindness, the connection “around the corner” and sometimes out of sight. Gifts, or perhaps more accurately the act of giving/receiving, reinforces the flow and vitality of connections within families, circles of friends and communities. We are talking about pretty big stakes, when you think about gift-giving in this light. But there are greater stakes. If we expand the idea of the gift beyond the handmade or store bought item, beyond the artistic talents of creative people, we arrive at the deeper, ancient gifts of culture. These gifts embody and transfer the knowledge, values and traditions so precious to us that we are driven to pass them on from one generation to the next. These gifts have crossed oceans, survived atrocities, dodged bullets and found their way into the very essence of who we are; a lullaby echoing the voice of your grandfather, a baking lesson with your mother, a gardening pattern that cultivates your sense of place, a ritual that connects you to the divine, a story diverting you from danger. These are the gifts that, if treasured, just might allow us to live peaceably on this planet. There is clearly a continuum of gift-giving. Birthday or holiday gifts are given with intention; with our hands, if you will. Artistic talents and cultural gifts are more innate, given with heart. But each is an act of generosity and in the giving or transferring has the capacity to enact kindnesses and reciprocity. Imagine if each gift given or received could foster peace and interconnectedness? As we ramp up to another residency, I look forward to digging more deeply into the soil/soul of the MACS program to discover together the gifts that the students and faculty bring to our community of practice. The time we share during the residency is its own gift – one that allows us to imagine what is precious in our communities and how we might work to sustain that which we treasure. Hyde, Lewis. 2007. The Gift: Creativity and the Artist in the Modern World. New York: Vintage Books. In a brief article on iOL Travel, Claire Allison, the marketing manager of Open Africa, insists that travelers must go beyond booking an eco-lodge or enviro-tour if they are truly concerned with sustainable travel. While there is certainly a strong argument that travel in itself goes against the goals of sustainability, if we (as travelers) are aiming to make the least amount of negative impact and, better still, looking to find ways to positively support the places we visit, we must consider the environment and the local people, economy, and cultures. 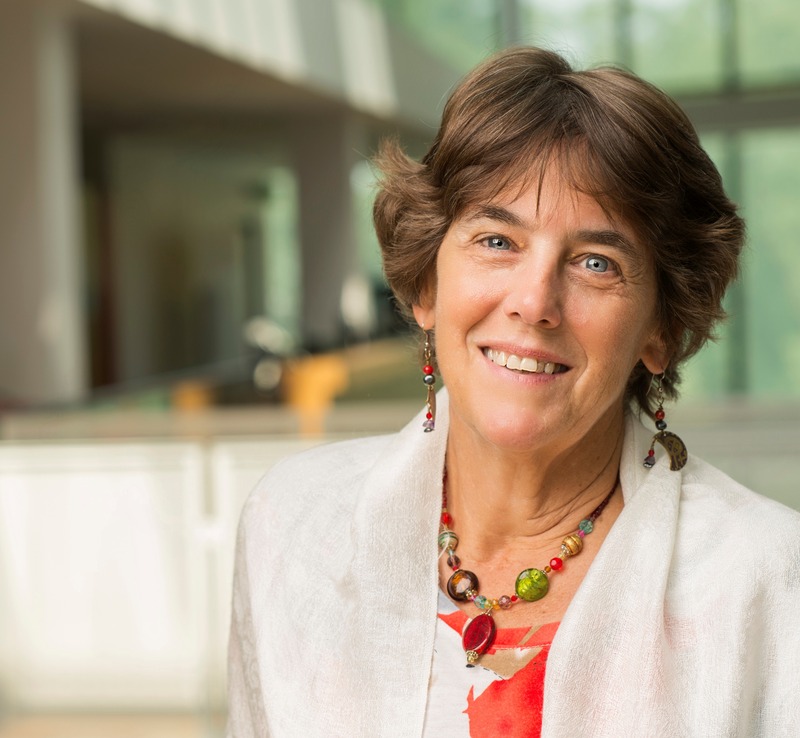 “Sustainable travel,” Allison states, “is about environmental, economic and socio-cultural sustainability and tourism needs to be sustainable in these three areas to be considered ‘sustainable tourism. '” I tend to agree with this overall sentiment, but what I find problematic with the article is that it is still written from a tourist-centric perspective. Allison writes that, “Socio-cultural sustainability is about including the local people in a tourist venture by employing them and minimising the negative impacts of increased tourist traffic. It’s also about preserving the local traditions, which offers travelers an authentic experience.” Rather than suggesting that local people be included by being employed by a tourist venture, how about suggesting that local people be in control of the tourist venture, or at minimum, that they are consulted? And perhaps better than “preserving local traditions” with the goal of offering “travelers an authentic experience,” shouldn’t the goal again be less about the traveler and more about leaving decisions – regarding what and how traditions are preserved – in the hands of the practitioners? In the article, Allison offers a few tips many of us are familiar with, including purchasing items from local artists and eating foods sourced locally. How do you define “sustainable travel?” What tips do you have for other travelers, as well as those engaged in the business of sustainable tourism, and/or communities that are frequented by travelers interested in environmental and cultural tourism? While attending Dr. Anderson’s Cultural Documentation class during the MACS residency in July and August 2013, I met Mary Briggs, a guest speaker who works with the Rivers of Steel National Heritage Area in Pittsburgh and the Arlington County Cultural Affairs in Virginia. Ms. Briggs mentioned the Awesome Foundation, a straight-forward, no-strings-attached grant that is “devoted to forwarding the interest of awesomeness in the universe.” There’s a simple application and selection process, and the Awesome Foundation awards $1,000 grants monthly to organizations in a wide range of areas, including technology, arts, social good, and beyond. When I heard this, I immediately had a dream and vision of how I would use the money to help a group of resettled refugee women in my local community maintain their cultural identity and traditional weaving skills. Four years earlier, while studying for my Bachelor of Arts degree in Cultural Anthropology at the University of North Florida, I began volunteering with refugees from Myanmar (Burma) who had been resettled to my hometown of Jacksonville, Florida. I was amazed by the intricately-woven handmade clothing that they used in functional ways, such as blankets for sleeping, slings for carrying newborns and infants, ropes for lashing firewood together, etc. The items all looked like individual pieces of artwork that should be preserved and appreciated to share the stories of the people who created them. After graduation in 2010, my husband and I moved to the Thailand-Burma border, where we immersed ourselves in the refugee camps and day-to-day lifestyle of refugees from Burma for two years. On numerous occasions, I observed women happily weaving clothing and textiles by hand for their family on looms that were also handmade out of bamboo poles and leather straps. 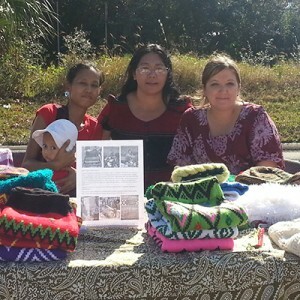 After two years of living abroad along the Thailand-Burma border, I returned to Jacksonville and began organizing a group of resettled refugee women who were interested in maintaining their unique cultural heritage. The women are of different ethnic sub-groups from Burma, including Kachin, Karen, Chin, and Shan ethnicities, and these groups would not normally associate with one another. 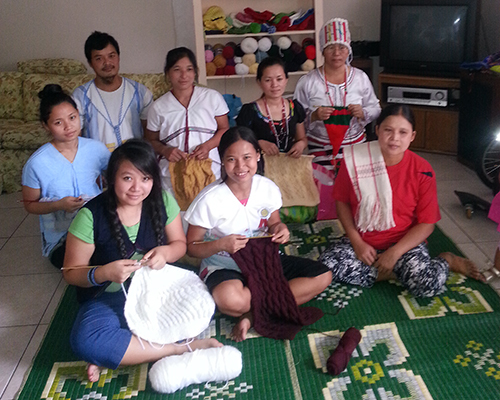 The women meet weekly to engage in their traditional handicrafts, such as weaving, knitting, crocheting, etc. While doing so, they discuss topics of interest to them, including women’s health, parenting and motherhood, financial concerns, etc. To advance the group, I applied for (and was fortunate enough to receive) a $1,000 grant from the Awesome Foundation to support the group, which came to be known as “Hope Through Common Threads.” With the grant money, we have purchased sewing machines, supplies such as yarn and needles, and raw materials to build new looms, as well as to rent space at local arts and crafts markets for selling the final products. Initiatives such as “Hope Through Common Threads” are not new to the US. Similar organizations exist in multiple cities around the country. However, I saw that such an organization did not exist in my local community of Jacksonville, Florida. My vision is that the organization can expand to resettled refugees from other countries and parts of the world, including the Middle East, Latin America, the Caribbean, and Africa. Anyone who is interested in maintaining their traditional handicrafts and traditions is welcome to join in! Ultimately, I think that the organization can help resettled refugees preserve their cultural identity, raise awareness of themselves within the greater community, generate additional revenue, and reduce their dependence upon social services organizations and financial support. I know that the MACS program at Goucher College will provide me with the knowledge and skills to work side-by-side and collaborate with the group to sustain their individual and community identities and foster their entrepreneurial spirit to create their own self-sustaining projects. As I learned during my first course, Introduction to Cultural Sustainability, William Westerman states in his article “Wild Grasses and New Arks: Transformative Potential in Applied and Public Folklore” that the practice of creating the art (weaving, for example) is just as important as the finished product itself. 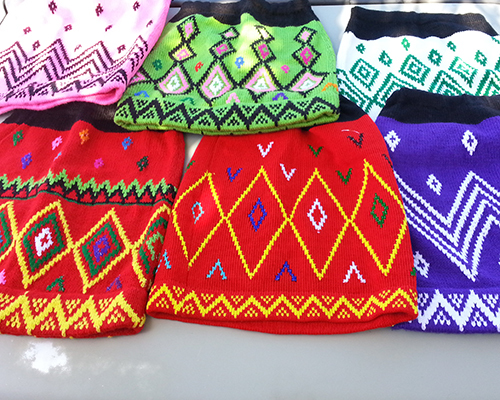 When the women of “Hope Through Common Threads” engage in their traditional handicrafts, they are preserving the skills that have been passed down to them from multiple generations of their ancestors. They are creating bridges to their own past, and they are creating cultural bridges between each other. Amber Dodge is a first-year student in the MACS program. She currently works as an Orientation Specialist in the Youth Department of Lutheran Social Services of Northeast Florida, preparing recently-resettled families of refugees to send their children into America’s public school system. Amber earned a Bachelor’s degree in Cultural Anthropology from the University of North Florida in Jacksonville. She and her husband, Steve, moved to the Thailand-Burma border to work with refugees in the refugee camps prior to their resettlement to the United States from 2010 until 2012. 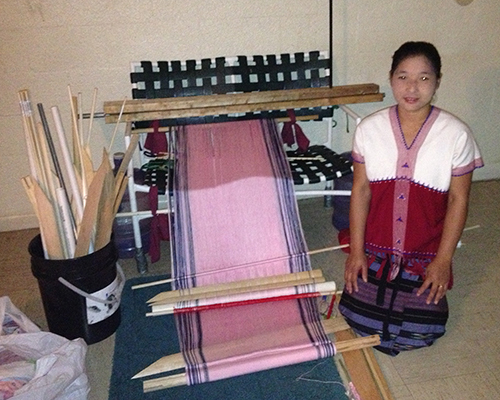 Amber is interested in Southeast Asian culture, learning Burmese language, and maintaining traditional weaving techniques. She currently has two young cats, a brother and sister named Theodore and Phoebe, who were rescued from the local Animal Care and Protective Services department. An ancient village, a modern shopping center: Can heritage and development coexist? While developers move forward with their plans to build a new shopping complex in downtown Miami, archaeologists are looking back at the history beneath. They have discovered that the site – one of the last remaining undeveloped lots in the area – was once quite likely a Tequesta village. Will developers proceed as planned? Or will they see the value in protecting and sharing a piece of the past with future visitors? Can cultural heritage and development coexist in a way that is mutually beneficial? Share your thoughts below and find out more about the discovery and the possibilities with NPR’s article here. Many families across the US will gather together tomorrow to feast and give thanks. But how many have ever questioned the true origins of the Thanksgiving holiday tradition? Indian Country Today Media asked the Mashpee Wampanoag Tribe’s Tribal Historic Preservation Officer, Ramona Peters, to share the Wampanoag side. As a child, what were you told about the history behind Thanksgiving? What do you tell your own children? Do you celebrate this holiday? If so, how? If not, why not? Please leave your comments below. Last month, I attended the annual meeting of the American Folklore Society, and I had the privilege of presenting on a panel with two students from my cohort in the MACS program, as well as our academic director, Amy Skillman. The theme of this year’s conference was cultural sustainability, so it was a great opportunity for us to dialogue with folklorists and scholars in related disciplines, to share some of our own thoughts and research and to hear what the term “cultural sustainability” brings to mind for those who may not have discussed it or contemplated it as much as we have in our courses. Although I was only able to attend a few panel sessions out of many with fascinating topics, I learned a lot just from conversations with other scholars between sessions. Overall, I came away from the conference encouraged about the possibilities that we can discover and create in this field. One of the most interesting things I learned came from Aisha M. Beliso-De Jesús, who talked about the idea of “smellscapes” in her paper on the “Santeria’s Sexualities” panel. I am fascinated by the role of the senses in ritual as well as the arts, and I will be thinking more about the olfactory aspect of cultural experience from now on. However, my greatest benefit from this AFS meeting, by far, was the time I spent with Jeff Todd Titon, whose work in ethnomusicology has been very influential on my thinking over the last year. We were paired with each other for the mentoring program, which I highly recommend to graduate students who attend future AFS meetings. We were able to get acquainted at one of many fun, casual receptions, where we also had a great chat with Bill Ivey, former National Endowment for the Arts chairman. Later, we attended a panel of Jeff’s former dissertation advisees, one of whom spoke about something very similar to my research interests: musicians’ perceptions of themselves and their bodies. I got to meet with these ethnomusicologists after the session, and hearing more about their research and career paths was very helpful for me as I am thinking about my own future in academia. As a MACS student, I was thrilled to hear Rory Turner’s plenary address on the opening night of the conference. His thoughtful consideration of this “collision of keywords” – cultural sustainability – brought to mind some of the valuable concepts I have learned from him and other Goucher professors: lessons from folklore, anthropology, environmental studies, and the intersections of so many disciplines and interests. With due regard for the problems in defining this term, Rory’s talk provided ample motivation for the growth of our field as a response to very real societal and environmental threats against people and their cultural traditions. “Let us invite people to love what they love,” he challenged us, offering a sense of purpose to all of the academic discussions that took place throughout the meeting. I am grateful to have met several folklorists who are already answering this call: not only do they love what they do, but they constantly seek out ways to sustain opportunities for loving the cultural worlds in which people live and work. Ben has spent much of his life writing and performing music, and he has been actively involved in the Philadelphia reggae scene for several years. His interests in culture, religion, and Afro-Caribbean music have led him to an academic inquiry into the relationships between artistic expression and social identity, with a particular focus on the music and ideology of Rastafari. 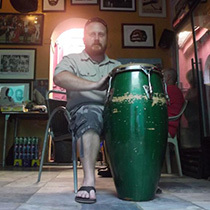 After graduating from the Pennsylvania State University with a BA in Letters, Arts, and Sciences, and a minor in Environmental Inquiry, Ben discovered that the MACS program would be a great way to maintain his interdisciplinary course of study while pursuing a career as a professor of anthropology and ethnomusicology. A fellow MACS graduate posted a link to Jimmy Nelson’s photography project “Before They Pass Away,” and invited thoughts from MACSers and friends. Certainly, the title alone is enough to spark discussion; the indigenous people that Jimmy photographed are living people with living cultures. His choice of words suggests that they have no choice, that their path has been decided and he is the “hero,” a self-proclaimed “last visual witness” to capture the images. What do you think of this project? Is there any value in it? Please leave your comments below. One of the most common questions I get asked from prospective MACS students and a question that some current students and grads may be asking is this: What kind of careers might a MACS graduate pursue? I believe the job possibilities are as diverse as the MACS faculty, students, and network. Just a glimpse into the faculty’s areas of interest and expertise and a quick scan of the research recent grads conducted for their Capstone projects should give you some small indication of the variety of interests, experiences, skills, and knowledge that converge in the MACS program, and some hope for equally diverse career possibilities. If you have other job search resources for fellow MACSers, please share them in the comments section below. Is anyone familiar with Bill Pfeiffer? Attended his Wild Earth Intensives? I came across this article and would love to hear any thoughts you MACSers might have.